Las Vegas is full of dazzling audiovisual exhibitions, and is a leader in employing novel technologies to create unforgettable, avant-garde experiences. So it should come as no surprise when a new bar opened using electronic ordering, and—get this—robotic bartenders. The Tipsy Robot opened in July of 2017 at the Miracle Mile Shops at Planet Hollywood Resort & Casino. With a robotic bartending duo and a team of eight humans, there is no shortage of drinks or technology in this venue. The experience all begins with the drink order. Patrons start their order on one of the custom-designed, self-ordering kiosks. The imageHOLDERS Slimline Portrait Tablet Kiosks were mounted on counter-height tables at a 45-degree angle for an optimal viewing, and the shell holds a Samsung Galaxy Tab A 10.1 and a contactless payment card reader, which required a LAVA Link USB hub. “The Slimline Tablet Kiosks were an ideal solution for Tipsy Robot, integrating contactless technology with swipe readers to create a POS and ordering kiosk for customers,” said Christian Bosence, account manager, imageHOLDERS. Visitors use the tablets to customize drinks in pretty much any way you can think of—customers can choose whether they want their drinks shaken or stirred…and when they want the shaking and stirring to occur. Patrons can even log in, save, and share their drinks with others. Once the kiosks send the signal to the robots, it adds the requested drinks to the queue, which is visually displayed, in real time, on Samsung 55-inch LCD displays. In other words, patrons are never left wondering when it will be their turn to quench their thirsts. In addition to the waiting list, users can see a “set of dynamic infographics” showing how others “enjoyed their creations, along with drink ratings,” Mornet said. Tipsy Robot uses signage to reduce perceived wait time, and also does so through the robots themselves—customers are often so busy watching drinks get made, taking pictures and sharing on social media, that they don’t even notice they’ve been waiting, Mornet said. So how did these robots snag their dream job? Robotic bartenders are the brainchild of a Massachusetts Institute of Technology (MIT) student. They were first commercially introduced on cruise ships, and Tipsy Robot claims to be the first bar on land with AI servers. The bionic bartending duo was made for Tipsy Robot by German-based custom automation firm KUKA Robotic Corporation. 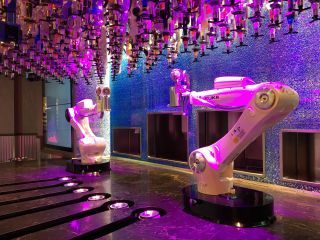 The robotic bartenders are placed on a futuristic-looking platform with the same items drinkers know and love, including more than 100 bottles of alcohol. “The core structure integrates the versatility of robots with different typologies, along with liquid dispensing systems, garnishes, ice dispensers, and all other functions needed to prepare a world-class cocktail,” Mornet said. Each cocktail takes between 60 and 90 seconds to make, and the bartenders can create up to 120 drinks per hour. What do these bartenders do in their down time? Reminiscent of a human bartender, they slice fruit to prepare for the next round of drinks. Even better, they can have a dance-off courtesy of the human operator on standby to assist, should any problems arise. The AV portion of installation was completed by Teledata Technology and the major systems are controlled through the Crestron TSW-760 touchpanel to include lighting levels, display source switching, volume, and audio source selection.